Artful Noise was established in 1997 as a performing group for concerts and events. Since then, we have provided music for thousands of guests at weddings and parties, private ceremonies and in concert halls. In recent years, we have enjoyed accompanying Portsmouth ProMusica, the Seacoast Community Chorus, Amare Cantare, the Community Chorus of South Berwick, the Granite State Choral Society, the Rockingham Choral Society, Women Singing Out, and Voices from the Heart. 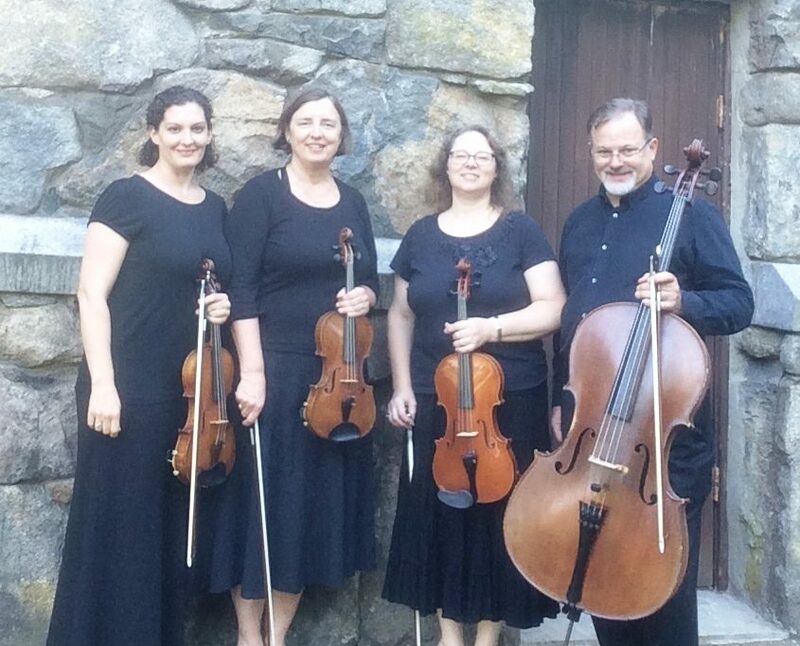 In August 2014, Artful Noise gave the world premier performance of Kevin Siegfried’s string quartet, “Land of Pure Delight,” at the Canterbury Shaker Museum’s Village Rising Festival, which we then reprised for concerts with Amare Cantare in 2015 and Portsmouth ProMusica in 2016. In 2003, we were selected to work with the UNH Symphony on Elgar’s Introduction and Allegro for String Quartet and Orchestra, rehearsing as the featured quartet with the orchestra in preparation for their performance with the world-renowned Shanghai String Quartet. During this time, we were honored to perform for a masterclass with the Shangai String quartet. Although we are all trained in traditional classical repertoire, we enjoy playing in other styles, and frequently join pit orchestras for musical theater productions. With our extensive collection of string quartet arrangements, we also entertain audiences with Celtic and American fiddle, jazzy showtunes and contemporary pop tunes. For a list of upcoming public concerts, join our mailing list! Gary Hodges has been performing and teaching in the Boston area for over 25 years. In addition to being a member of the Artful Noise string quartet, he is in the Kelsh Trio, NH Klaviertrio, and is a freelance artist throughout New England. 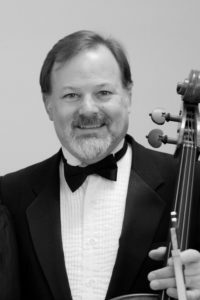 He has served as principal cellist of the New Hampshire Philharmonic and worked with Amare Cantare, Granite State Choral Society, the Community Chorus of South Berwick, Portsmouth ProMusica, and the Seacoast Community Chorus. He has also accompanied Peter Mayer on tour. Mr. Hodges has studied with Mary Rasmussen, Larry Veal, Sato Knudsen, Andres Diaz, and David Wells. In addition to the cello, Mr. Hodges also plays the viola da gamba. He has been member of the Goodmorrow Consort, the Portland Early Music Consort, and the Woodman Consort. 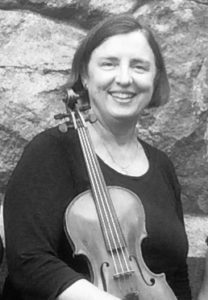 Lynne White McMahon holds degrees in violin performance and music education from Smith College and has studied under Phillip Naegele, Giorgio Ciompi, and Ani Kavafian. She has played with many chamber ensembles as a freelance artist throughout the New England region, including Portland Symphony Orchestra, Portsmouth Symphony Orchestra, the Lakes Region Symphony Orchestra, and many community choruses in the seacoast region. In addition to performing regularly as a member of the Artful Noise String Quartet, Lynne has taught in many area schools including Berwick Academy in South Berwick, Maine, and the York, Maine public schools. She teaches at Portsmouth Music and Arts Center in Portsmouth, New Hampshire and in her studio at home in Cape Neddick, Maine. Sally Wituszynski earned a Bachelor of Music degree in Viola Performance from the New England Conservatory of Music, where she studied with Heidi Castleman and Marcus Thompson. 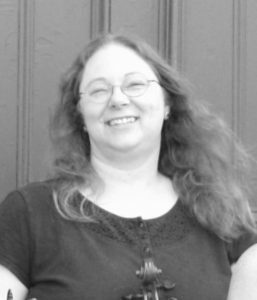 She has also completed a Master’s degree in Music Education from the University of New Hampshire.Sally has played in many ensembles, including the Vermont Symphony, the Hanover Handel Society, the Granite State Symphony, the Boston New Music Initiative, the Portsmouth Symphony, and the New Hampshire Philharmonic. She is the principal violist for the Lakes Region Symphony Orchestra, and a founding member of the Artful Noise String Quartet. As an active freelance performer throughout New England, Sally has appeared onstage with Dionne Warwick and David Gates, and she performed at the 2012 PARMA Contemporary Music Festival in Portsmouth, NH.Sally has also maintained a private teaching studio in the New Hampshire Seacoast area since 1984, and is the Past President of the New Hampshire Chapter of the American String Teachers’ Association. She has spent many summers teaching in the University of New Hampshire’s Summer Youth Music School programs, and she is a frequent guest conductor at both the Maine and New Hampshire Statewide String Festivals. Sally was the string teacher and orchestra director at Berwick Academy in southern Maine for 20 years, and she was the Master Teacher for the String Project at the University of New Hampshire for four years. She currently directs the string program at Tri-City Christian Academy near her home in Somersworth, NH.